5 Why are you cast down, O my soul? And why are you disquieted within me? Hope in God, for I shall yet praise Him For the help of His countenance. 6 O my God, my soul is cast down within me; Therefore I will remember You from the land of the Jordan, And from the heights of Hermon, From the Hill Mizar. 7 Deep calls unto deep at the noise of Your waterfalls; All Your waves and billows have gone over me. 8 The Lord will command His loving kindness in the daytime, And in the night His song shall be with me— A prayer to the God of my life. 9 I will say to God my Rock, “Why have You forgotten me? Why do I go mourning because of the oppression of the enemy?” 10 As with a breaking of my bones, My enemies reproach me, While they say to me all day long, “Where is your God?” 11 Why are you cast down, O my soul? And why are you disquieted within me? Hope in God; For I shall yet praise Him, The help of my countenance and my God. If by any chance you happen to be in a hospital and see people who are sick without any strength. You definitely can see the difference with the people who have the hope who are more visible in high spirits and more positive word said to live in their hope. Many testimonies say that miracles are awarded to people who have hope. 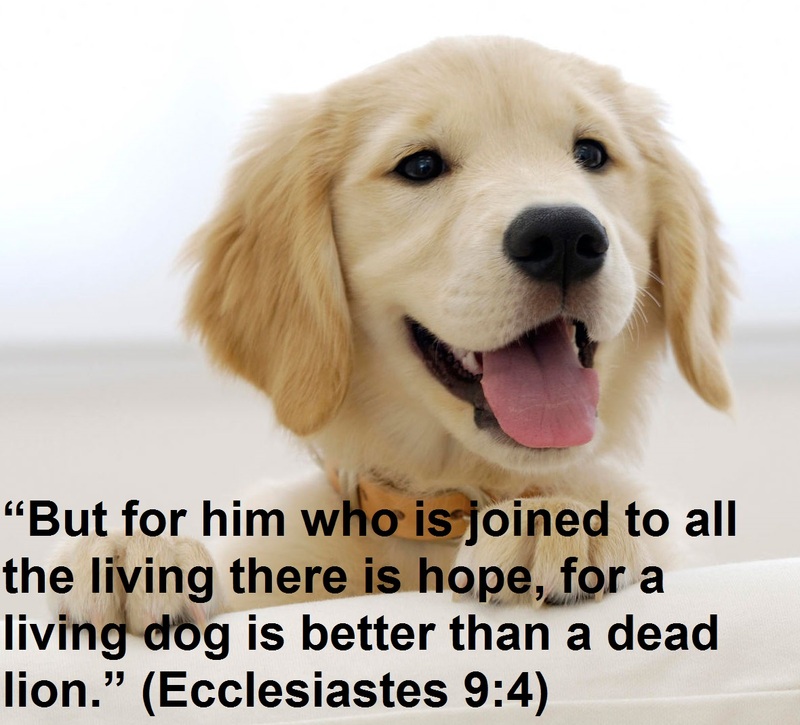 The above Word of God above says that hope is a sign a human is alive and has a life. Try to remember the last time you were under pressure and had become desperate? At that time, although you still had a life but your heart and your life felt dry and seemed empty. Maybe you eat but are not satisfied, bathroom is not clean, body feels tired but the mind is hovering. At night time you expect morning to come soon, during the day you want the night to come soon. You live but do not enjoy life even lost the meaning of life itself. Those are the conditions of people without hope. But when you have hope in the Lord, even before you there is a problem of the Red Sea, Jericho’s problem, problem of confronting Goliath, you will be given a new strength every day to enjoy and conquer your problems. Why are you depressed O my soul, why are you anxious within me? Hope to God! 20 Now there were certain Greeks among those who came up to worship at the feast. 21 Then they came to Philip, who was from Bethsaida of Galilee, and asked him, saying, “Sir, we wish to see Jesus.” 22 Philip came and told Andrew, and in turn Andrew and Philip told Jesus. 23 But Jesus answered them, saying, “The hour has come that the Son of Man should be glorified. 24 Most assuredly, I say to you, unless a grain of wheat falls into the ground and dies, it remains alone; but if it dies, it produces much grain. 25 He who loves his life will lose it, and he who hates his life in this world will keep it for eternal life. 26 If anyone serves Me, let him follow Me; and where I am, there My servant will be also. If anyone serves Me, him My Father will honor. 13 In the eighteenth year of King Jeroboam, Abijah became king over Judah. 2 He reigned three years in Jerusalem. His mother’s name was Michaiah the daughter of Uriel of Gibeah. And there was war between Abijah and Jeroboam. 3 Abijah set the battle in order with an army of valiant warriors, four hundred thousand choice men. Jeroboam also drew up in battle formation against him with eight hundred thousand choice men, mighty men of valor. 4 Then Abijah stood on Mount Zemaraim, which is in the mountains of Ephraim, and said, “Hear me, Jeroboam and all Israel: 5 Should you not know that the Lord God of Israel gave the dominion over Israel to David forever, to him and his sons, by a covenant of salt? 6 Yet Jeroboam the son of Nebat, the servant of Solomon the son of David, rose up and rebelled against his lord. 7 Then worthless rogues gathered to him, and strengthened themselves against Rehoboam the son of Solomon, when Rehoboam was young and inexperienced and could not withstand them. 8 And now you think to withstand the kingdom of the Lord, which is in the hand of the sons of David; and you are a great multitude, and with you are the gold calves which Jeroboam made for you as gods. 9 Have you not cast out the priests of the Lord, the sons of Aaron, and the Levites, and made for yourselves priests, like the peoples of other lands, so that whoever comes to consecrate himself with a young bull and seven rams may be a priest of things that are not gods? 10 But as for us, the Lord is our God, and we have not forsaken Him; and the priests who minister to the Lord are the sons of Aaron, and the Levites attend to their duties. 11 And they burn to the Lord every morning and every evening burnt sacrifices and sweet incense; they also set the showbread in order on the pure gold table, and the lampstand of gold with its lamps to burn every evening; for we keep the command of the Lord our God, but you have forsaken Him. 12 Now look, God Himself is with us as our head, and His priests with sounding trumpets to sound the alarm against you. O children of Israel, do not fight against the Lord God of your fathers, for you shall not prosper!” 13 But Jeroboam caused an ambush to go around behind them; so they were in front of Judah, and the ambush was behind them. 14 And when Judah looked around, to their surprise the battle line was at both front and rear; and they cried out to the Lord, and the priests sounded the trumpets. 15 Then the men of Judah gave a shout; and as the men of Judah shouted, it happened that God struck Jeroboam and all Israel before Abijah and Judah. 16 And the children of Israel fled before Judah, and God delivered them into their hand. 17 Then Abijah and his people struck them with a great slaughter; so five hundred thousand choice men of Israel fell slain. 18 Thus the children of Israel were subdued at that time; and the children of Judah prevailed, because they relied on the Lord God of their fathers. 19 And Abijah pursued Jeroboam and took cities from him: Bethel with its villages, Jeshanah with its villages, and Ephrain with its villages. 20 So Jeroboam did not recover strength again in the days of Abijah; and the Lord struck him, and he died. 21 But Abijah grew mighty, married fourteen wives, and begot twenty-two sons and sixteen daughters. 22 Now the rest of the acts of Abijah, his ways, and his sayings are written in the annals of the prophet Iddo. 14 So Abijah rested with his fathers, and they buried him in the City of David. Then Asa his son reigned in his place. In his days the land was quiet for ten years. 2 Asa did what was good and right in the eyes of the Lord his God, 3 for he removed the altars of the foreign gods and the high places, and broke down the sacred pillars and cut down the wooden images. 4 He commanded Judah to seek the Lord God of their fathers, and to observe the law and the commandment. 5 He also removed the high places and the incense altars from all the cities of Judah, and the kingdom was quiet under him. 6 And he built fortified cities in Judah, for the land had rest; he had no war in those years, because the Lord had given him rest. 7 Therefore he said to Judah, “Let us build these cities and make walls around them, and towers, gates, and bars, while the land is yet before us, because we have sought the Lord our God; we have sought Him, and He has given us rest on every side.” So they built and prospered. 8 And Asa had an army of three hundred thousand from Judah who carried shields and spears, and from Benjamin two hundred and eighty thousand men who carried shields and drew bows; all these were mighty men of valor. 9 Then Zerah the Ethiopian came out against them with an army of a million men and three hundred chariots, and he came to Mareshah. 10 So Asa went out against him, and they set the troops in battle array in the Valley of Zephathah at Mareshah. 11 And Asa cried out to the Lord his God, and said, “Lord, it is nothing for You to help, whether with many or with those who have no power; help us, O Lord our God, for we rest on You, and in Your name we go against this multitude. O Lord, You are our God; do not let man prevail against You!” 12 So the Lord struck the Ethiopians before Asa and Judah, and the Ethiopians fled. 13 And Asa and the people who were with him pursued them to Gerar. So the Ethiopians were overthrown, and they could not recover, for they were broken before the Lord and His army. And they carried away very much spoil. 14 Then they defeated all the cities around Gerar, for the fear of the Lord came upon them; and they plundered all the cities, for there was exceedingly much spoil in them. 15 They also attacked the livestock enclosures, and carried off sheep and camels in abundance, and returned to Jerusalem. The guidance of God will never stop, when we surrender to Him. If we walk faithfully following God’s guidance, anything that we do in the guidance of God will never fail. If we live in God’s guidance, God promised He is always with us in all things to guide us even He will carry us when the storm hit us. David was the one who was always looking for the Lord and His presence before he made a decision and it was done consistently well in all conditions, even in the desert, the king’s palace, or hiding in the cave. Because he understood that without God’s guidance and protection, he would only get emptiness even if he won. David would never act before God gave His guidance. Therefore, David was the only king who recorded to never losing a single battle although in his life, he had to walk through the valley of death. God’s protection will always be with you, when you surrender to God. Verily, He is the Lord who always carries you on His back when the black clouds come into your life. 45 Then many of the Jews who had come to Mary, and had seen the things Jesus did, believed in Him. 46 But some of them went away to the Pharisees and told them the things Jesus did. 47 Then the chief priests and the Pharisees gathered a council and said, “What shall we do? For this Man works many signs. 48 If we let Him alone like this, everyone will believe in Him, and the Romans will come and take away both our place and nation.” 49 And one of them, Caiaphas, being high priest that year, said to them, “You know nothing at all, 50 nor do you consider that it is expedient for us that one man should die for the people, and not that the whole nation should perish.” 51 Now this he did not say on his own authority; but being high priest that year he prophesied that Jesus would die for the nation, 52 and not for that nation only, but also that He would gather together in one the children of God who were scattered abroad. 53 Then, from that day on, they plotted to put Him to death. 54 Therefore Jesus no longer walked openly among the Jews, but went from there into the country near the wilderness, to a city called Ephraim, and there remained with His disciples. 55 And the Passover of the Jews was near, and many went from the country up to Jerusalem before the Passover, to purify themselves. 56 Then they sought Jesus, and spoke among themselves as they stood in the temple, “What do you think—that He will not come to the feast?” 57 Now both the chief priests and the Pharisees had given a command, that if anyone knew where He was, he should report it, that they might seize Him. 10 And Rehoboam went to Shechem, for all Israel had gone to Shechem to make him king. 2 So it happened, when Jeroboam the son of Nebat heard it (he was in Egypt, where he had fled from the presence of King Solomon), that Jeroboam returned from Egypt. 3 Then they sent for him and called him. And Jeroboam and all Israel came and spoke to Rehoboam, saying, 4 “Your father made our yoke heavy; now therefore, lighten the burdensome service of your father and his heavy yoke which he put on us, and we will serve you.” 5 So he said to them, “Come back to me after three days.” And the people departed. 6 Then King Rehoboam consulted the elders who stood before his father Solomon while he still lived, saying, “How do you advise me to answer these people?” 7 And they spoke to him, saying, “If you are kind to these people, and please them, and speak good words to them, they will be your servants forever.” 8 But he rejected the advice which the elders had given him, and consulted the young men who had grown up with him, who stood before him. 9 And he said to them, “What advice do you give? How should we answer this people who have spoken to me, saying, ‘Lighten the yoke which your father put on us’?” 10 Then the young men who had grown up with him spoke to him, saying, “Thus you should speak to the people who have spoken to you, saying, ‘Your father made our yoke heavy, but you make it lighter on us’—thus you shall say to them: ‘My little finger shall be thicker than my father’s waist! 11 And now, whereas my father put a heavy yoke on you, I will add to your yoke; my father chastised you with whips, but I will chastise you with scourges!’” 12 So Jeroboam and all the people came to Rehoboam on the third day, as the king had directed, saying, “Come back to me the third day.” 13 Then the king answered them roughly. King Rehoboam rejected the advice of the elders, 14 and he spoke to them according to the advice of the young men, saying, “My father made your yoke heavy, but I will add to it; my father chastised you with whips, but I will chastise you with scourges!” 15 So the king did not listen to the people; for the turn of events was from God, that the Lord might fulfill His word, which He had spoken by the hand of Ahijah the Shilonite to Jeroboam the son of Nebat. 16 Now when all Israel saw that the king did not listen to them, the people answered the king, saying: “What share have we in David? We have no inheritance in the son of Jesse. Every man to your tents, O Israel! Now see to your own house, O David!” So all Israel departed to their tents. 17 But Rehoboam reigned over the children of Israel who dwelt in the cities of Judah. 18 Then King Rehoboam sent Hadoram, who was in charge of revenue; but the children of Israel stoned him with stones, and he died. Therefore King Rehoboam mounted his chariot in haste to flee to Jerusalem. 19 So Israel has been in rebellion against the house of David to this day. 11 Now when Rehoboam came to Jerusalem, he assembled from the house of Judah and Benjamin one hundred and eighty thousand chosen men who were warriors, to fight against Israel, that he might restore the kingdom to Rehoboam. 2 But the word of the Lord came to Shemaiah the man of God, saying, 3 “Speak to Rehoboam the son of Solomon, king of Judah, and to all Israel in Judah and Benjamin, saying, 4 ‘Thus says the Lord: “You shall not go up or fight against your brethren! Let every man return to his house, for this thing is from Me.”’” Therefore they obeyed the words of the Lord, and turned back from attacking Jeroboam. 5 So Rehoboam dwelt in Jerusalem, and built cities for defense in Judah. 6 And he built Bethlehem, Etam, Tekoa, 7 Beth Zur, Sochoh, Adullam, 8 Gath, Mareshah, Ziph, 9 Adoraim, Lachish, Azekah, 10 Zorah, Aijalon, and Hebron, which are in Judah and Benjamin, fortified cities. 11 And he fortified the strongholds, and put captains in them, and stores of food, oil, and wine. 12 Also in every city he put shields and spears, and made them very strong, having Judah and Benjamin on his side. 13 And from all their territories the priests and the Levites who were in all Israel took their stand with him. 14 For the Levites left their common-lands and their possessions and came to Judah and Jerusalem, for Jeroboam and his sons had rejected them from serving as priests to the Lord. 15 Then he appointed for himself priests for the high places, for the demons, and the calf idols which he had made. 16 And after the Levites left, those from all the tribes of Israel, such as set their heart to seek the Lord God of Israel, came to Jerusalem to sacrifice to the Lord God of their fathers. 17 So they strengthened the kingdom of Judah, and made Rehoboam the son of Solomon strong for three years, because they walked in the way of David and Solomon for three years. 18 Then Rehoboam took for himself as wife Mahalath the daughter of Jerimoth the son of David, and of Abihail the daughter of Eliah the son of Jesse. 19 And she bore him children: Jeush, Shamariah, and Zaham. 20 After her he took Maachah the granddaughter of Absalom; and she bore him Abijah, Attai, Ziza, and Shelomith. 21 Now Rehoboam loved Maachah the granddaughter of Absalom more than all his wives and his concubines; for he took eighteen wives and sixty concubines, and begot twenty-eight sons and sixty daughters. 22 And Rehoboam appointed Abijah the son of Maachah as chief, to be leader among his brothers; for he intended to make him king. 23 He dealt wisely, and dispersed some of his sons throughout all the territories of Judah and Benjamin, to every fortified city; and he gave them provisions in abundance. He also sought many wives for them. 12 Now it came to pass, when Rehoboam had established the kingdom and had strengthened himself, that he forsook the law of the Lord, and all Israel along with him. 2 And it happened in the fifth year of King Rehoboam that Shishak king of Egypt came up against Jerusalem, because they had transgressed against the Lord, 3 with twelve hundred chariots, sixty thousand horsemen, and people without number who came with him out of Egypt—the Lubim and the Sukkiim and the Ethiopians. 4 And he took the fortified cities of Judah and came to Jerusalem. 5 Then Shemaiah the prophet came to Rehoboam and the leaders of Judah, who were gathered together in Jerusalem because of Shishak, and said to them, “Thus says the Lord: ‘You have forsaken Me, and therefore I also have left you in the hand of Shishak.’” 6 So the leaders of Israel and the king humbled themselves; and they said, “The Lord is righteous.” 7 Now when the Lord saw that they humbled themselves, the word of the Lord came to Shemaiah, saying, “They have humbled themselves; therefore I will not destroy them, but I will grant them some deliverance. My wrath shall not be poured out on Jerusalem by the hand of Shishak. 8 Nevertheless they will be his servants, that they may distinguish My service from the service of the kingdoms of the nations.” 9 So Shishak king of Egypt came up against Jerusalem, and took away the treasures of the house of the Lord and the treasures of the king’s house; he took everything. He also carried away the gold shields which Solomon had made. 10 Then King Rehoboam made bronze shields in their place, and committed them to the hands of the captains of the guard, who guarded the doorway of the king’s house. 11 And whenever the king entered the house of the Lord, the guard would go and bring them out; then they would take them back into the guardroom. 12 When he humbled himself, the wrath of the Lord turned from him, so as not to destroy him completely; and things also went well in Judah. 13 Thus King Rehoboam strengthened himself in Jerusalem and reigned. Now Rehoboam was forty-one years old when he became king; and he reigned seventeen years in Jerusalem, the city which the Lord had chosen out of all the tribes of Israel, to put His name there. His mother’s name was Naamah, an Ammonitess. 14 And he did evil, because he did not prepare his heart to seek the Lord. 15 The acts of Rehoboam, first and last, are they not written in the book of Shemaiah the prophet, and of Iddo the seer concerning genealogies? And there were wars between Rehoboam and Jeroboam all their days. 16 So Rehoboam rested with his fathers, and was buried in the City of David. Then Abijah his son reigned in his place. 19 So Samuel grew, and the Lord was with him and let none of his words fall to the ground. 20 And all Israel from Dan to Beersheba knew that Samuel had been established as a prophet of the Lord. Many believers say that they have heard the voice of God every day, how about us, do we also experience as most of the believers? Or even we are one of the believers who have often wondered how to hear God’s voice? There are people who are hungry for clues and do not hesitate to spend much money to go anywhere and buy anything to be able to hear God’s voice. But the more they find, the more they are disappointed for nothing to get, because only to those people who have intimacy with God can hear God’s voice. There are several reasons why most people fail to hear God’s voice? Never have intimacy and only come to the Lord and His presence only when need help. Take advantages from the presence of God to satisfy the lust and desire only when they need God, they will treat God as a servant but if they do not need a God they do not care about God. Find God with half-hearted and lukewarm, easily to be discouraged, disappointed and quickly switching faith and direction. Words of God recorded in the Bible said that if we should respect and fear of God, maintain the intimacy with God through prayer and worship earnestly, always stay in His presence, and seek earnestly, so to listen to God’s voice is in fact an ordinary matter. Build your altar of pray, use your time to have fellowship with God, and remain in the presence of God then you will hear the God’s voice. When you get close with God, then you can hear the God’s voice at all times. 28 And when she had said these things, she went her way and secretly called Mary her sister, saying, “The Teacher has come and is calling for you.” 29 As soon as she heard that, she arose quickly and came to Him. 4 Then the king and all the people offered sacrifices before the Lord. 5 King Solomon offered a sacrifice of twenty-two thousand bulls and one hundred and twenty thousand sheep. So the king and all the people dedicated the house of God. 6 And the priests attended to their services; the Levites also with instruments of the music of the Lord, which King David had made to praise the Lord, saying, “For His mercy endures forever,” whenever David offered praise by their ministry. The priests sounded trumpets opposite them, while all Israel stood. 7 Furthermore Solomon consecrated the middle of the court that was in front of the house of the Lord; for there he offered burnt offerings and the fat of the peace offerings, because the bronze altar which Solomon had made was not able to receive the burnt offerings, the grain offerings, and the fat. 8 At that time Solomon kept the feast seven days, and all Israel with him, a very great assembly from the entrance of Hamath to the Brook of Egypt. 9 And on the eighth day they held a sacred assembly, for they observed the dedication of the altar seven days, and the feast seven days. 10 On the twenty-third day of the seventh month he sent the people away to their tents, joyful and glad of heart for the good that the Lord had done for David, for Solomon, and for His people Israel. 11 Thus Solomon finished the house of the Lord and the king’s house; and Solomon successfully accomplished all that came into his heart to make in the house of the Lord and in his own house. 8 It came to pass at the end of twenty years, when Solomon had built the house of the Lord and his own house, 2 that the cities which Hiram had given to Solomon, Solomon built them; and he settled the children of Israel there.3 And Solomon went to Hamath Zobah and seized it. 4 He also built Tadmor in the wilderness, and all the storage cities which he built in Hamath. 5 He built Upper Beth Horon and Lower Beth Horon, fortified cities with walls, gates, and bars, 6 also Baalath and all the storage cities that Solomon had, and all the chariot cities and the cities of the cavalry, and all that Solomon desired to build in Jerusalem, in Lebanon, and in all the land of his dominion. 7 All the people who were left of the Hittites, Amorites, Perizzites, Hivites, and Jebusites, who were not of Israel— 8 that is, their descendants who were left in the land after them, whom the children of Israel did not destroy—from these Solomon raised forced labor, as it is to this day. 9 But Solomon did not make the children of Israel servants for his work. Some were men of war, captains of his officers, captains of his chariots, and his cavalry. 10 And others were chiefs of the officials of King Solomon: two hundred and fifty, who ruled over the people. 11 Now Solomon brought the daughter of Pharaoh up from the City of David to the house he had built for her, for he said, “My wife shall not dwell in the house of David king of Israel, because the places to which the ark of the Lord has come are holy.” 12 Then Solomon offered burnt offerings to the Lord on the altar of the Lord which he had built before the vestibule, 13 according to the daily rate, offering according to the commandment of Moses, for the Sabbaths, the New Moons, and the three appointed yearly feasts—the Feast of Unleavened Bread, the Feast of Weeks, and the Feast of Tabernacles. 14 And, according to the order of David his father, he appointed the divisions of the priests for their service, the Levites for their duties (to praise and serve before the priests) as the duty of each day required, and the gatekeepers by their divisions at each gate; for so David the man of God had commanded. 15 They did not depart from the command of the king to the priests and Levites concerning any matter or concerning the treasuries. 16 Now all the work of Solomon was well-ordered from the day of the foundation of the house of the Lord until it was finished. So the house of the Lord was completed. 17 Then Solomon went to Ezion Geber and Elath on the seacoast, in the land of Edom. 18 And Hiram sent him ships by the hand of his servants, and servants who knew the sea. They went with the servants of Solomon to Ophir, and acquired four hundred and fifty talents of gold from there, and brought it to King Solomon. 9 Now when the queen of Sheba heard of the fame of Solomon, she came to Jerusalem to test Solomon with hard questions, having a very great retinue, camels that bore spices, gold in abundance, and precious stones; and when she came to Solomon, she spoke with him about all that was in her heart. 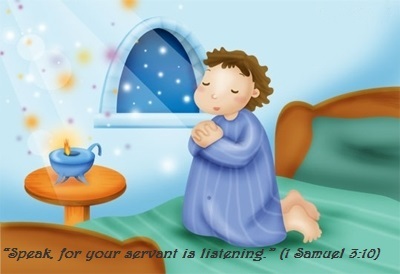 2 So Solomon answered all her questions; there was nothing so difficult for Solomon that he could not explain it to her. 3 And when the queen of Sheba had seen the wisdom of Solomon, the house that he had built, 4 the food on his table, the seating of his servants, the service of his waiters and their apparel, his cupbearers and their apparel, and his entryway by which he went up to the house of the Lord, there was no more spirit in her. 5 Then she said to the king: “It was a true report which I heard in my own land about your words and your wisdom. 6 However I did not believe their words until I came and saw with my own eyes; and indeed the half of the greatness of your wisdom was not told me. You exceed the fame of which I heard.7 Happy are your men and happy are these your servants, who stand continually before you and hear your wisdom! 8 Blessed be the Lord your God, who delighted in you, setting you on His throne to be king for the Lord your God! Because your God has loved Israel, to establish them forever, therefore He made you king over them, to do justice and righteousness.” 9 And she gave the king one hundred and twenty talents of gold, spices in great abundance, and precious stones; there never were any spices such as those the queen of Sheba gave to King Solomon. 10 Also, the servants of Hiram and the servants of Solomon, who brought gold from Ophir, brought algum wood and precious stones. 11 And the king made walkways of the algum wood for the house of the Lord and for the king’s house, also harps and stringed instruments for singers; and there were none such as these seen before in the land of Judah. 12 Now King Solomon gave to the queen of Sheba all she desired, whatever she asked, much more than she had brought to the king. So she turned and went to her own country, she and her servants. 13 The weight of gold that came to Solomon yearly was six hundred and sixty-six talents of gold, 14 besides what the traveling merchants and traders brought. And all the kings of Arabia and governors of the country brought gold and silver to Solomon. 15 And King Solomon made two hundred large shields of hammered gold; six hundred shekels of hammered gold went into each shield. 16 He also made three hundred shields of hammered gold; three hundred shekels of gold went into each shield. The king put them in the House of the Forest of Lebanon. 7 Moreover the king made a great throne of ivory, and overlaid it with pure gold. 18 The throne had six steps, with a footstool of gold, which were fastened to the throne; there were armrests on either side of the place of the seat, and two lions stood beside the armrests. 19 Twelve lions stood there, one on each side of the six steps; nothing like this had been made for any other kingdom. 20 All King Solomon’s drinking vessels were gold, and all the vessels of the House of the Forest of Lebanon were pure gold. Not one was silver, for this was accounted as nothing in the days of Solomon. 21 For the king’s ships went to Tarshish with the servants of Hiram. Once every three years the merchant ships came, bringing gold, silver, ivory, apes, and monkeys. 22 So King Solomon surpassed all the kings of the earth in riches and wisdom. 23 And all the kings of the earth sought the presence of Solomon to hear his wisdom, which God had put in his heart. 24 Each man brought his present: articles of silver and gold, garments, armor, spices, horses, and mules, at a set rate year by year. 25 Solomon had four thousand stalls for horses and chariots, and twelve thousand horsemen whom he stationed in the chariot cities and with the king at Jerusalem. 26 So he reigned over all the kings from the River to the land of the Philistines, as far as the border of Egypt. 27 The king made silver as common in Jerusalem as stones, and he made cedar trees as abundant as the sycamores which are in the lowland. 28 And they brought horses to Solomon from Egypt and from all lands. 29 Now the rest of the acts of Solomon, first and last, are they not written in the book of Nathan the prophet, in the prophecy of Ahijah the Shilonite, and in the visions of Iddo the seer concerning Jeroboam the son of Nebat? 30 Solomon reigned in Jerusalem over all Israel forty years. 31 Then Solomon rested with his fathers, and was buried in the City of David his father. And Rehoboam his son reigned in his place. One day you buy a large ornament of stone and it weighs 150 kg, the stone you just bought for a decoration in your garden to make it looks artistic and adds beauty to your garden. The problem that burdens you is that you have to move it in order to place it in the appropriate place for the stone to function and add beauty to the garden. When you have to lift it, for sure you will figure out how to move the heavy stone and then you make plans. Things that maybe you can do is: when you directly lift and move the stone, it is not possible because the stone is too heavy. Or first break the stone into small pieces, then just take it, but it will certainly ruin the function of the stone as a decoration. Or you will use the tool to lift it to avoid injury; it will not be useless and will not damage the function of the stone. Similarly to the problems you carry on lately, you might say your burden is too heavy, do not be discouraged, loose heart and protracted in sadness. Today, start it by looking at your problem, secondly, use the tool of your faith in the Lord Jesus, the Holy Spirit will enable you to lift up the mountain of your problem, and then dump it. Use the tool of your faith in Jesus, when you experience such a heavy burden. When you decide to use the tool of your faith, you can even get rid of a problem which as big as a mountain. 31 Then the Jews took up stones again to stone Him. 32 Jesus answered them, “Many good works I have shown you from My Father. For which of those works do you stone Me?” 33 The Jews answered Him, saying, “For a good work we do not stone You, but for blasphemy, and because You, being a Man, make Yourself God.” 34 Jesus answered them, “Is it not written in your law, ‘I said, “You are gods”’? 35 If He called them gods, to whom the word of God came (and the Scripture cannot be broken), 36 do you say of Him whom the Father sanctified and sent into the world, ‘You are blaspheming,’ because I said, ‘I am the Son of God’? 37 If I do not do the works of My Father, do not believe Me; 38 but if I do, though you do not believe Me, believe the works, that you may know and believe that the Father is in Me, and I in Him.” 39 Therefore they sought again to seize Him, but He escaped out of their hand. 4 Moreover he made a bronze altar: twenty cubits was its length, twenty cubits its width, and ten cubits its height. 2 Then he made the Sea of cast bronze, ten cubits from one brim to the other; it was completely round. Its height was five cubits, and a line of thirty cubits measured its circumference. 3 And under it was the likeness of oxen encircling it all around, ten to a cubit, all the way around the Sea. The oxen were cast in two rows, when it was cast. 4 It stood on twelve oxen: three looking toward the north, three looking toward the west, three looking toward the south, and three looking toward the east; the Sea was set upon them, and all their back parts pointed inward. 5 It was a handbreadth thick; and its brim was shaped like the brim of a cup, like a lily blossom. It contained three thousand baths. 6 He also made ten lavers, and put five on the right side and five on the left, to wash in them; such things as they offered for the burnt offering they would wash in them, but the Sea was for the priests to wash in. 7 And he made ten lampstands of gold according to their design, and set them in the temple, five on the right side and five on the left. 8 He also made ten tables, and placed them in the temple, five on the right side and five on the left. And he made one hundred bowls of gold. 9 Furthermore he made the court of the priests, and the great court and doors for the court; and he overlaid these doors with bronze. 10 He set the Sea on the right side, toward the southeast. 11 Then Huram made the pots and the shovels and the bowls. So Huram finished doing the work that he was to do for King Solomon for the house of God: 12 the two pillars and the bowl-shaped capitals that were on top of the two pillars; the two networks covering the two bowl-shaped capitals which were on top of the pillars; 13 four hundred pomegranates for the two networks (two rows of pomegranates for each network, to cover the two bowl-shaped capitals that were on the pillars); 14 he also made carts and the lavers on the carts; 15 one Sea and twelve oxen under it; 16 also the pots, the shovels, the forks—and all their articles Huram his master craftsman made of burnished bronze for King Solomon for the house of the Lord. 17 In the plain of Jordan the king had them cast in clay molds, between Succoth and Zeredah. 18 And Solomon had all these articles made in such great abundance that the weight of the bronze was not determined. 19 Thus Solomon had all the furnishings made for the house of God: the altar of gold and the tables on which was the showbread; 20 the lampstands with their lamps of pure gold, to burn in the prescribed manner in front of the inner sanctuary, 21 with the flowers and the lamps and the wick-trimmers of gold, of purest gold; 22 the trimmers, the bowls, the ladles, and the censers of pure gold. As for the entry of the sanctuary, its inner doors to the Most Holy Place, and the doors of the main hall of the temple, were gold. 5 So all the work that Solomon had done for the house of the Lord was finished; and Solomon brought in the things which his father David had dedicated: the silver and the gold and all the furnishings. And he put them in the treasuries of the house of God. 6 Now Jericho was securely shut up because of the children of Israel; none went out, and none came in. 2 And the Lord said to Joshua: “See! I have given Jericho into your hand, its king, and the mighty men of valor. 3 You shall march around the city, all you men of war; you shall go all around the city once. This you shall do six days. 4 And seven priests shall bear seven trumpets of rams’ horns before the ark. But the seventh day you shall march around the city seven times, and the priests shall blow the trumpets. 5 It shall come to pass, when they make a long blast with the ram’s horn, and when you hear the sound of the trumpet, that all the people shall shout with a great shout; then the wall of the city will fall down flat. And the people shall go up every man straight before him.” 6 Then Joshua the son of Nun called the priests and said to them, “Take up the ark of the covenant, and let seven priests bear seven trumpets of rams’ horns before the ark of the Lord.” 7 And he said to the people, “Proceed, and march around the city, and let him who is armed advance before the ark of the Lord.” 8 So it was, when Joshua had spoken to the people, that the seven priests bearing the seven trumpets of rams’ horns before the Lord advanced and blew the trumpets, and the ark of the covenant of the Lord followed them. 9 The armed men went before the priests who blew the trumpets, and the rear guard came after the ark, while the priests continued blowing the trumpets. 10 Now Joshua had commanded the people, saying, “You shall not shout or make any noise with your voice, nor shall a word proceed out of your mouth, until the day I say to you, ‘Shout!’ Then you shall shout.” 11 So he had the ark of the Lord circle the city, going around it once. Then they came into the camp and lodged in the camp. 12 And Joshua rose early in the morning, and the priests took up the ark of the Lord. 13 Then seven priests bearing seven trumpets of rams’ horns before the ark of the Lord went on continually and blew with the trumpets. And the armed men went before them. But the rear guard came after the ark of the Lord, while the priests continued blowing the trumpets. 14 And the second day they marched around the city once and returned to the camp. So they did six days. 15 But it came to pass on the seventh day that they rose early, about the dawning of the day, and marched around the city seven times in the same manner. On that day only they marched around the city seven times. 16 And the seventh time it happened, when the priests blew the trumpets, that Joshua said to the people: “Shout, for the Lord has given you the city! 17 Now the city shall be doomed by the Lord to destruction, it and all who are in it. Only Rahab the harlot shall live, she and all who are with her in the house, because she hid the messengers that we sent. 18 And you, by all means abstain from the accursed things, lest you become accursed when you take of the accursed things, and make the camp of Israel a curse, and trouble it. 19 But all the silver and gold, and vessels of bronze and iron, are consecrated to the Lord; they shall come into the treasury of the Lord.” 20 So the people shouted when the priests blew the trumpets. And it happened when the people heard the sound of the trumpet, and the people shouted with a great shout, that the wall fell down flat. Then the people went up into the city, every man straight before him, and they took the city. 21 And they utterly destroyed all that was in the city, both man and woman, young and old, ox and sheep and donkey, with the edge of the sword. 22 But Joshua had said to the two men who had spied out the country, “Go into the harlot’s house, and from there bring out the woman and all that she has, as you swore to her.” 23 And the young men who had been spies went in and brought out Rahab, her father, her mother, her brothers, and all that she had. So they brought out all her relatives and left them outside the camp of Israel. 24 But they burned the city and all that was in it with fire. Only the silver and gold, and the vessels of bronze and iron, they put into the treasury of the house of the Lord. 25 And Joshua spared Rahab the harlot, her father’s household, and all that she had. So she dwells in Israel to this day, because she hid the messengers whom Joshua sent to spy out Jericho. 26 Then Joshua charged them at that time, saying, “Cursed be the man before the Lord who rises up and builds this city Jericho; he shall lay its foundation with his firstborn, and with his youngest he shall set up its gates.” 27 So the Lord was with Joshua, and his fame spread throughout all the country. It is not a few people who believe having faith in God, but the question is whether we just simply have faith, all of our visions and dreams can come true? In James 2:26 clearly says that faith without deeds is dead. So even though we have faith in our vision and our dreams, but if we do not dare to step forward, that faith will die over time and eventually we lost the vision and dream. The step of faith is a statement of our believing faith in God. Indeed, to perform a step of faith will not be easy; sometimes it needs obedient to push us to step forward bravely. When the nation of Israel was about to break into the city of Jericho, they faithfully performed the step of faith around the walls of Jericho for seven days, blowing trumpets and such wall finally collapsed. This was one incredible action step of faith of obedience from the nation of Israel. 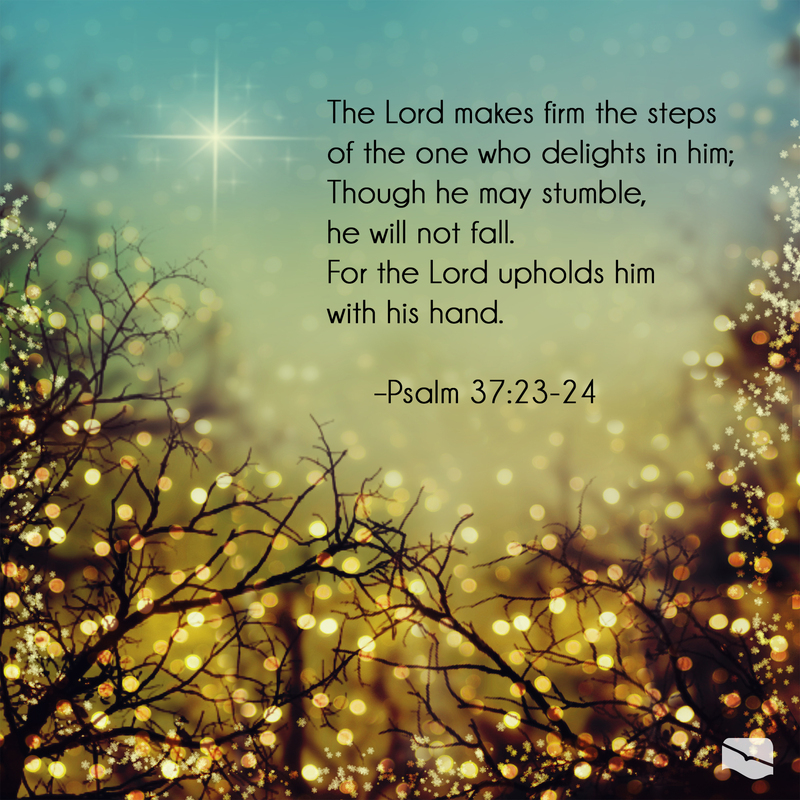 Maybe they did not initially understand why God told them to circle the walls of Jericho for seven days, but the obedient made them willing to take a step of faith that made them win. What happens if the Israelites did not step forward in faith to circle the walls of Jericho? Surely, the Israelites would not seize the city. Today, when you have the faith to believe in Jesus, and are waiting for your vision and dreams to be fulfilled, do not stand still, say it in your faith and obey to perform the step of faith, even though it looks does not make any sense then you will see the result. You only need to be obedient to move forward. Do not wait to see your visions and dreams to happen, move forward in faith right away. 22 Now it was the Feast of Dedication in Jerusalem, and it was winter. 23 And Jesus walked in the temple, in Solomon’s porch. 13 So Solomon came to Jerusalem from the high place that was at Gibeon, from before the tabernacle of meeting, and reigned over Israel. 14 And Solomon gathered chariots and horsemen; he had one thousand four hundred chariots and twelve thousand horsemen, whom he stationed in the chariot cities and with the king in Jerusalem. 15 Also the king made silver and gold as common in Jerusalem as stones, and he made cedars as abundant as the sycamores which are in the lowland. 16 And Solomon had horses imported from Egypt and Keveh; the king’s merchants bought them in Keveh at the current price. 17 They also acquired and imported from Egypt a chariot for six hundred shekels of silver, and a horse for one hundred and fifty; thus, through their agents, they exported them to all the kings of the Hittites and the kings of Syria. 2 Then Solomon determined to build a temple for the name of the Lord, and a royal house for himself. 2 Solomon selected seventy thousand men to bear burdens, eighty thousand to quarry stone in the mountains, and three thousand six hundred to oversee them. 3 Then Solomon sent to Hiram king of Tyre, saying: As you have dealt with David my father, and sent him cedars to build himself a house to dwell in, so deal with me. 4 Behold, I am building a temple for the name of the Lord my God, to dedicate it to Him, to burn before Him sweet incense, for the continual showbread, for the burnt offerings morning and evening, on the Sabbaths, on the New Moons, and on the set feasts of the Lord our God. This is an ordinance forever to Israel. 5 And the temple which I build will be great, for our God is greater than all gods. 6 But who is able to build Him a temple, since heaven and the heaven of heavens cannot contain Him? Who am I then, that I should build Him a temple, except to burn sacrifice before Him? 7 Therefore send me at once a man skillful to work in gold and silver, in bronze and iron, in purple and crimson and blue, who has skill to engrave with the skillful men who are with me in Judah and Jerusalem, whom David my father provided. 8 Also send me cedar and cypress and algum logs from Lebanon, for I know that your servants have skill to cut timber in Lebanon; and indeed my servants will be with your servants, 9 to prepare timber for me in abundance, for the temple which I am about to build shall be great and wonderful. 10 And indeed I will give to your servants, the woodsmen who cut timber, twenty thousand kors of ground wheat, twenty thousand kors of barley, twenty thousand baths of wine, and twenty thousand baths of oil. 11 Then Hiram king of Tyre answered in writing, which he sent to Solomon: Because the Lord loves His people, He has made you king over them. 12 Hiram also said: Blessed be the Lord God of Israel, who made heaven and earth, for He has given King David a wise son, endowed with prudence and understanding, who will build a temple for the Lord and a royal house for himself! 13 And now I have sent a skillful man, endowed with understanding, Huram my master craftsman 14 (the son of a woman of the daughters of Dan, and his father was a man of Tyre), skilled to work in gold and silver, bronze and iron, stone and wood, purple and blue, fine linen and crimson, and to make any engraving and to accomplish any plan which may be given to him, with your skillful men and with the skillful men of my lord David your father. 15 Now therefore, the wheat, the barley, the oil, and the wine which my lord has spoken of, let him send to his servants. 16 And we will cut wood from Lebanon, as much as you need; we will bring it to you in rafts by sea to Joppa, and you will carry it up to Jerusalem. 17 Then Solomon numbered all the aliens who were in the land of Israel, after the census in which David his father had numbered them; and there were found to be one hundred and fifty-three thousand six hundred. 18 And he made seventy thousands of them bearers of burdens, eighty thousand stonecutters in the mountain, and three thousand six hundred overseers to make the people work. 3 Now Solomon began to build the house of the Lord at Jerusalem on Mount Moriah, where the Lord had appeared to his father David, at the place that David had prepared on the threshing floor of Ornan the Jebusite. 2 And he began to build on the second day of the second month in the fourth year of his reign. 3 This is the foundation which Solomon laid for building the house of God: The length was sixty cubits (by cubits according to the former measure) and the width twenty cubits. 4 And the vestibule that was in front of the sanctuary was twenty cubits long across the width of the house, and the height was one hundred and twenty. He overlaid the inside with pure gold. 5 The larger room he paneled with cypress which he overlaid with fine gold, and he carved palm trees and chainwork on it. 6 And he decorated the house with precious stones for beauty, and the gold was gold from Parvaim. 7 He also overlaid the house—the beams and doorposts, its walls and doors—with gold; and he carved cherubim on the walls. 8 And he made the Most Holy Place. Its length was according to the width of the house, twenty cubits, and its width twenty cubits. He overlaid it with six hundred talents of fine gold. 9 The weight of the nails was fifty shekels of gold; and he overlaid the upper area with gold. 10 In the Most Holy Place he made two cherubim, fashioned by carving, and overlaid them with gold. 11 The wings of the cherubim were twenty cubits in overall length: one wing of the one cherub was five cubits, touching the wall of the room, and the other wing was five cubits, touching the wing of the other cherub; 12 one wing of the other cherub was five cubits, touching the wall of the room, and the other wing also was five cubits, touching the wing of the other cherub. 13 The wings of these cherubim spanned twenty cubits overall. They stood on their feet, and they faced inward. 14 And he made the veil of blue, purple, crimson, and fine linen, and wove cherubim into it. 15 Also he made in front of the temple two pillars thirty-five cubits high, and the capital that was on the top of each of them was five cubits. 16 He made wreaths of chainwork, as in the inner sanctuary, and put them on top of the pillars; and he made one hundred pomegranates, and put them on the wreaths of chainwork. 17 Then he set up the pillars before the temple, one on the right hand and the other on the left; he called the name of the one on the right hand Jachin, and the name of the one on the left Boaz. 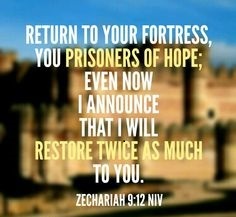 When you are struggling to rely on your own strength and the chance is you are going to face a dead-end, God through His words re-reminded in Zechariah 9:12 to return into the presence of God, which is a miraculous fortress. The parable of the prodigal son, gave us a picture of person when he was in a dead-end, hungry, did not know where to go, but he was reminded of his father’s house. Eventually, he came back to his father’ home, so he revived. 1. Back to the fortress of God, that is the presence of God. 2. Increase your hope in believing faith in God and be persevered. 3. Listen to the voice of God in His presence that He delights to hear, delights to answer and restores the lost in multiplying. When you take a step of faith according to the above Word of God, then God will give you more than what we believe in. The door of God’s presence is never closed for you; God always welcomes you with open arms, immediately return to God’s presence when you are facing a dead-end. You will get protection, help and joy when you come back into the presence of God. 24 So they again called the man who was blind, and said to him, “Give God the glory! We know that this Man is a sinner.” 25 He answered and said, “Whether He is a sinner or not I do not know. One thing I know: that though I was blind, now I see.” 26 Then they said to him again, “What did He do to you? How did He open your eyes?” 27 He answered them, “I told you already, and you did not listen. Why do you want to hear it again? Do you also want to become His disciples?” 28 Then they reviled him and said, “You are His disciple, but we are Moses’ disciples. 29 We know that God spoke to Moses; as for this fellow, we do not know where He is from.” 30 The man answered and said to them, “Why, this is a marvellous thing, that you do not know where He is from; yet He has opened my eyes! 31 Now we know that God does not hear sinners; but if anyone is a worshiper of God and does His will, He hears him. 32 Since the world began it has been unheard of that anyone opened the eyes of one who was born blind. 33 If this Man were not from God, He could do nothing.” 34 They answered and said to him, “You were completely born in sins, and are you teaching us?” And they cast him out. 35 Jesus heard that they had cast him out; and when He had found him, He said to him, “Do you believe in the Son of God?” 36 He answered and said, “Who is He, Lord, that I may believe in Him?” 37 And Jesus said to him, “You have both seen Him and it is He who is talking with you.” 38 Then he said, “Lord, I believe!” And he worshiped Him. 39 And Jesus said, “For judgment I have come into this world, that those who do not see may see, and that those who see may be made blind.” 40 Then some of the Pharisees who were with Him heard these words, and said to Him, “Are we blind also?” 41 Jesus said to them, “If you were blind, you would have no sin; but now you say, ‘We see.’ Therefore your sin remains. 29 Furthermore King David said to all the assembly: “My son Solomon, whom alone God has chosen, is young and inexperienced; and the work is great, because the temple is not for man but for the Lord God. 2 Now for the house of my God I have prepared with all my might: gold for things to be made of gold, silver for things of silver, bronze for things of bronze, iron for things of iron, wood for things of wood, onyx stones, stones to be set, glistening stones of various colors, all kinds of precious stones, and marble slabs in abundance. 3 Moreover, because I have set my affection on the house of my God, I have given to the house of my God, over and above all that I have prepared for the holy house, my own special treasure of gold and silver: 4 three thousand talents of gold, of the gold of Ophir, and seven thousand talents of refined silver, to overlay the walls of the houses; 5 the gold for things of gold and the silver for things of silver, and for all kinds of work to be done by the hands of craftsmen. Who then is willing to consecrate himself this day to the Lord?” 6 Then the leaders of the fathers’ houses, leaders of the tribes of Israel, the captains of thousands and of hundreds, with the officers over the king’s work, offered willingly. 7 They gave for the work of the house of God five thousand talents and ten thousand darics of gold, ten thousand talents of silver, eighteen thousand talents of bronze, and one hundred thousand talents of iron. 8 And whoever had precious stones gave them to the treasury of the house of the Lord, into the hand of Jehiel the Gershonite. 9 Then the people rejoiced, for they had offered willingly, because with a loyal heart they had offered willingly to the Lord; and King David also rejoiced greatly. “Blessed are You, Lord God of Israel, our Father, forever and ever. 11 Yours, O Lord, is the greatness, The power and the glory, The victory and the majesty; For all that is in heaven and in earth is Yours; Yours is the kingdom, O Lord, And You are exalted as head over all. 12 Both riches and honor come from You, And You reign over all. In Your hand is power and might; In Your hand it is to make great And to give strength to all. 13 “Now therefore, our God, We thank You And praise Your glorious name. 14 But who am I, and who are my people, That we should be able to offer so willingly as this? For all things come from You, And of Your own we have given You. 15 For we are aliens and pilgrims before You, As were all our fathers; Our days on earth are as a shadow, And without hope. 16 “O Lord our God, all this abundance that we have prepared to build You a house for Your holy name is from Your hand, and is all Your own. 7 I know also, my God, that You test the heart and have pleasure in uprightness. As for me, in the uprightness of my heart I have willingly offered all these things; and now with joy I have seen Your people, who are present here to offer willingly to You. 18 O Lord God of Abraham, Isaac, and Israel, our fathers, keep this forever in the intent of the thoughts of the heart of Your people, and fix their heart toward You. 19 And give my son Solomon a loyal heart to keep Your commandments and Your testimonies and Your statutes, to do all these things, and to build the temple for which I have made provision.” 20 Then David said to all the assembly, “Now bless the Lord your God.” So all the assembly blessed the Lord God of their fathers, and bowed their heads and prostrated themselves before the Lord and the king. 21 And they made sacrifices to the Lord and offered burnt offerings to the Lord on the next day: a thousand bulls, a thousand rams, a thousand lambs, with their drink offerings, and sacrifices in abundance for all Israel. 22 So they ate and drank before the Lord with great gladness on that day. And they made Solomon the son of David king the second time, anointed him before the Lord to be the leader, and Zadok to be priest. 23 Then Solomon sat on the throne of the Lord as king instead of David his father, and prospered; and all Israel obeyed him. 24 All the leaders and the mighty men, and also all the sons of King David, submitted themselves to King Solomon. 25 So the Lord exalted Solomon exceedingly in the sight of all Israel, and bestowed on him such royal majesty as had not been on any king before him in Israel. 26 Thus David the son of Jesse reigned over all Israel. 27 And the period that he reigned over Israel was forty years; seven years he reigned in Hebron, and thirty-three years he reigned in Jerusalem. 28 So he died in a good old age, full of days and riches and honor; and Solomon his son reigned in his place. 29 Now the acts of King David, first and last, indeed they are written in the book of Samuel the seer, in the book of Nathan the prophet, and in the book of Gad the seer, 30 with all his reign and his might, and the events that happened to him, to Israel, and to all the kingdoms of the lands. Someone, who recognizes something or stuff well and correctly, proves that this person is the owner of such stuff. 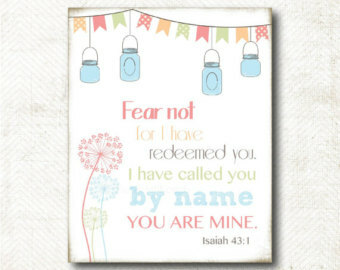 God has said in Isaiah 43:1, “Do not fear, for I have redeemed you; I have summoned you by name; you are mine.” This verse proves that God knows well and correctly each of His children, and therefore He calls us by our names. This means that we belong to the Lord, because He knows us well. We have been redeemed by the His expensive blood, because we are very valuable in God’s sight. Regarding this verse, it has also been confirmed to each of us to never in doubt on God’s faithful love. God, as the owner of a life fully sovereign over our lives, is God who knows everything. When He has a plan for us and then He will lead us to walk towards which He has planned, that is a design that full of peace, brings a future with hope (Jeremiah 29:11). To achieve what is planned, sometimes God gives signs that we do not deviate from His plan. Signs may be barriers after barriers that give us a sign if we get out of the path of God’s plan, so we can return back to the way, the truth and the life. Sometimes, He will give a warning to us through signs and circumstances around us, God can tell you His plan through the believers around us, even very likely God Himself speaking in audible to tell us His plan. So, that we are the beloved ones may receive all of the good ones that He had planned and enjoy it. It is what He will do to the people of His possession. Do not ever be afraid with anything anymore, because you belong to God. You belong to God, who had been redeemed by His holy blood then you will surely receive God’s promises. 25 Moreover David and the captains of the army separated for the service some of the sons of Asaph, of Heman, and of Jeduthun, who should prophesy with harps, stringed instruments, and cymbals. And the number of the skilled men performing their service was: 2 Of the sons of Asaph: Zaccur, Joseph, Nethaniah, and Asharelah; the sons of Asaph were under the direction of Asaph, who prophesied according to the order of the king. 3 Of Jeduthun, the sons of Jeduthun: Gedaliah, Zeri, Jeshaiah, Shimei, Hashabiah, and Mattithiah, six, under the direction of their father Jeduthun, who prophesied with a harp to give thanks and to praise the Lord. 4 Of Heman, the sons of Heman: Bukkiah, Mattaniah, Uzziel, Shebuel, Jerimoth, Hananiah, Hanani, Eliathah, Giddalti, Romamti-Ezer, Joshbekashah, Mallothi, Hothir, and Mahazioth. 5 All these were the sons of Heman the king’s seer in the words of God, to exalt his horn. For God gave Heman fourteen sons and three daughters. 6 All these were under the direction of their father for the music in the house of the Lord, with cymbals, stringed instruments, and harps, for the service of the house of God. Asaph, Jeduthun, and Heman were under the authority of the king. 7 So the number of them, with their brethren who were instructed in the songs of the Lord, all who were skillful, was two hundred and eighty-eight. 8 And they cast lots for their duty, the small as well as the great, the teacher with the student. 9 Now the first lot for Asaph came out for Joseph; the second for Gedaliah, him with his brethren and sons, twelve; 10 the third for Zaccur, his sons and his brethren, twelve; 11 the fourth for Jizri, his sons and his brethren, twelve;12 the fifth for Nethaniah, his sons and his brethren, twelve; 13 the sixth for Bukkiah, his sons and his brethren, twelve; 14 the seventh for Jesharelah, his sons and his brethren, twelve; 15 the eighth for Jeshaiah, his sons and his brethren, twelve; 16 the ninth for Mattaniah, his sons and his brethren, twelve; 17 the tenth for Shimei, his sons and his brethren, twelve; 18 the eleventh for Azarel, his sons and his brethren, twelve; 19 the twelfth for Hashabiah, his sons and his brethren, twelve; 20 the thirteenth for Shubael, his sons and his brethren, twelve; 21 the fourteenth for Mattithiah, his sons and his brethren, twelve; 22 the fifteenth for Jeremoth, his sons and his brethren, twelve; 23 the sixteenth for Hananiah, his sons and his brethren, twelve; 24 the seventeenth for Joshbekashah, his sons and his brethren, twelve; 25 the eighteenth for Hanani, his sons and his brethren, twelve; 26 the nineteenth for Mallothi, his sons and his brethren, twelve; 27 the twentieth for Eliathah, his sons and his brethren, twelve; 28 the twenty-first for Hothir, his sons and his brethren, twelve; 29 the twenty-second for Giddalti, his sons and his brethren, twelve; 30 the twenty-third for Mahazioth, his sons and his brethren, twelve; 31 the twenty-fourth for Romamti-Ezer, his sons and his brethren, twelve. 26 Concerning the divisions of the gatekeepers: of the Korahites, Meshelemiah the son of Kore, of the sons of Asaph. 2 And the sons of Meshelemiah were Zechariah the firstborn, Jediael the second, Zebadiah the third, Jathniel the fourth, 3 Elam the fifth, Jehohanan the sixth, Eliehoenai the seventh. 4 Moreover the sons of Obed-Edom were Shemaiah the firstborn, Jehozabad the second, Joah the third, Sacar the fourth, Nethanel the fifth, 5 Ammiel the sixth, Issachar the seventh, Peulthai the eighth; for God blessed him. 6 Also to Shemaiah his son were sons born who governed their fathers’ houses, because they were men of great ability. 7 The sons of Shemaiah were Othni, Rephael, Obed, and Elzabad, whose brothers Elihu and Semachiah were able men. 8 All these were of the sons of Obed-Edom, they and their sons and their brethren, able men with strength for the work: sixty-two of Obed-Edom. 9 And Meshelemiah had sons and brethren, eighteen able men. 10 Also Hosah, of the children of Merari, had sons: Shimri the first (for though he was not the firstborn, his father made him the first), 11 Hilkiah the second, Tebaliah the third, Zechariah the fourth; all the sons and brethren of Hosah were thirteen. 12 Among these were the divisions of the gatekeepers, among the chief men, having duties just like their brethren, to serve in the house of the Lord. 13 And they cast lots for each gate, the small as well as the great, according to their father’s house. 14 The lot for the East Gate fell to Shelemiah. Then they cast lots for his son Zechariah, a wise counselor, and his lot came out for the North Gate; 15 to Obed-Edom the South Gate, and to his sons the storehouse. 16 To Shuppim and Hosah the lot came out for the West Gate, with the Shallecheth Gate on the ascending highway—watchman opposite watchman. 17 On the east were six Levites, on the north four each day, on the south four each day, and for the storehouse two by two. 18 As for the Parbar on the west, there were four on the highway and two at the Parbar. 19 These were the divisions of the gatekeepers among the sons of Korah and among the sons of Merari. 20 Of the Levites, Ahijah was over the treasuries of the house of God and over the treasuries of the dedicated things. 21 The sons of Laadan, the descendants of the Gershonites of Laadan, heads of their fathers’ houses, of Laadan the Gershonite: Jehieli. 22 The sons of Jehieli, Zetham and Joel his brother, were over the treasuries of the house of the Lord. 23 Of the Amramites, the Izharites, the Hebronites, and the Uzzielites: 24 Shebuel the son of Gershom, the son of Moses, was overseer of the treasuries. 25 And his brethren by Eliezer were Rehabiah his son, Jeshaiah his son, Joram his son, Zichri his son, and Shelomith his son. 26 This Shelomith and his brethren were over all the treasuries of the dedicated things which King David and the heads of fathers’ houses, the captains over thousands and hundreds, and the captains of the army, had dedicated. 27 Some of the spoils won in battles they dedicated to maintain the house of the Lord. 28 And all that Samuel the seer, Saul the son of Kish, Abner the son of Ner, and Joab the son of Zeruiah had dedicated, every dedicated thing, was under the hand of Shelomith and his brethren. 29 Of the Izharites, Chenaniah and his sons performed duties as officials and judges over Israel outside Jerusalem. 30 Of the Hebronites, Hashabiah and his brethren, one thousand seven hundred able men, had the oversight of Israel on the west side of the Jordan for all the business of the Lord, and in the service of the king. 31 Among the Hebronites, Jerijah was head of the Hebronites according to his genealogy of the fathers. In the fortieth year of the reign of David they were sought, and there were found among them capable men at Jazer of Gilead. 32 And his brethren were two thousand seven hundred able men, heads of fathers’ houses, whom King David made officials over the Reubenites, the Gadites, and the half-tribe of Manasseh, for every matter pertaining to God and the affairs of the king. 27 And the children of Israel, according to their number, the heads of fathers’ houses, the captains of thousands and hundreds and their officers, served the king in every matter of the military divisions. These divisions came in and went out month by month throughout all the months of the year, each division having twenty-four thousand. 2 Over the first division for the first month was Jashobeam the son of Zabdiel, and in his division were twenty-four thousand; 3 he was of the children of Perez, and the chief of all the captains of the army for the first month. 4 Over the division of the second month was Dodai an Ahohite, and of his division Mikloth also was the leader; in his division were twenty-four thousand. 5 The third captain of the army for the third month was Benaiah, the son of Jehoiada the priest, who was chief; in his division were twenty-four thousand. 6 This was the Benaiah who was mighty among the thirty, and was over the thirty; in his division was Ammizabad his son. 7 The fourth captain for the fourth month was Asahel the brother of Joab, and Zebadiah his son after him; in his division were twenty-four thousand. 8 The fifth captain for the fifth month was Shamhuth the Izrahite; in his division were twenty-four thousand. 9 The sixth captain for the sixth month was Ira the son of Ikkesh the Tekoite; in his division were twenty-four thousand. 10 The seventh captain for the seventh month was Helez the Pelonite, of the children of Ephraim; in his division were twenty-four thousand. 11 The eighth captain for the eighth month was Sibbechai the Hushathite, of the Zarhites; in his division were twenty-four thousand. 12 The ninth captain for the ninth month was Abiezer the Anathothite, of the Benjamites; in his division were twenty-four thousand. 13 The tenth captain for the tenth month was Maharai the Netophathite, of the Zarhites; in his division were twenty-four thousand. 14 The eleventh captain for the eleventh month was Benaiah the Pirathonite, of the children of Ephraim; in his division were twenty-four thousand. 15 The twelfth captain for the twelfth month was Heldai the Netophathite, of Othniel; in his division were twenty-four thousand. 16 Furthermore, over the tribes of Israel: the officer over the Reubenites was Eliezer the son of Zichri; over the Simeonites, Shephatiah the son of Maachah;17 over the Levites, Hashabiah the son of Kemuel; over the Aaronites, Zadok;18 over Judah, Elihu, one of David’s brothers; over Issachar, Omri the son of Michael; 19 over Zebulun, Ishmaiah the son of Obadiah; over Naphtali, Jerimoth the son of Azriel; 20 over the children of Ephraim, Hoshea the son of Azaziah;over the half-tribe of Manasseh, Joel the son of Pedaiah; 21 over the half–tribeof Manasseh in Gilead, Iddo the son of Zechariah; over Benjamin, Jaasiel the son of Abner; 22 over Dan, Azarel the son of Jeroham. These were the leaders of the tribes of Israel. 23 But David did not take the number of those twenty years old and under, because the Lord had said He would multiply Israel like the stars of the heavens. 24 Joab the son of Zeruiah began a census, but he did not finish, for wrath came upon Israel because of this census; nor was the number recorded in the account of the chronicles of King David. 25 And Azmaveth the son of Adiel was over the king’s treasuries; and Jehonathan the son of Uzziah was over the storehouses in the field, in the cities, in the villages, and in the fortresses. 26 Ezri the son of Chelub was over those who did the work of the field for tilling the ground. 27 And Shimei the Ramathite was over the vineyards, and Zabdi the Shiphmite was over the produce of the vineyards for the supply of wine. 28 Baal-Hanan the Gederite was over the olive trees and the sycamore trees that were in the lowlands, and Joash was over the store of oil. 29 And Shitrai the Sharonite was over the herds that fed in Sharon, and Shaphat the son of Adlai was over the herds that werein the valleys. 30 Obil the Ishmaelite was over the camels, Jehdeiah the Meronothite was over the donkeys, 31 and Jaziz the Hagrite was over the flocks. All these were the officials over King David’s property. 32 Also Jehonathan, David’s uncle, was a counselor, a wise man, and a scribe; and Jehiel the son of Hachmoni was with the king’s sons. 33 Ahithophel was the king’s counselor, and Hushai the Archite was the king’s companion. 34 After Ahithophel was Jehoiada the son of Benaiah, then Abiathar. And the general of the king’s army was Joab.